Attorney Thomas B. Felder Wednesday morning issued a card to the public in which he accounts for the funds subscribed to employ the Burns detectives to work upon the Phagan murder case. He reports that but $102 was collected. 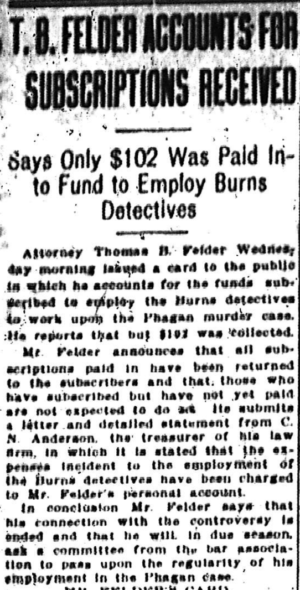 Mr. Felder announces that all subscriptions paid in have been returned to the subscribers and that those who have subscribed but have not yet paid are not expected to do […] submits a letter and detailed statement from C. N. Anderson, the treasurer of his law firm, in which it is stated that the expenses incident to the employment of the Burns detectives have been charged to Mr. Felder’s personal account. In conclusion Mr. Felder says that his connection with the controversy is ended and that he will in due season ask a committee from the bar association to pass upon the regularity of his employment in the Phagan case. “First. I submit a letter addressed to me by Mr. C. N. Anderson. “Second. A statement prepared by Mr. Anderson, showing all moneys resolved by my law firm. “Third. Mr. Charles I. Ryan, who was designated as custodian of the fund without his knowledge or consent, informs me that he has already returned to the contributors whatever money was paid in to him. “Fourth. The Atlanta Journal subscribed $100, and I am informed that certain subscriptions were made to it. This subscription has not been paid in and is not expected, and The Journal is hereby requested to return to the contributors any sums that it has received. “Fifth. The Atlanta Constitution subscribed $100, and I am informed that certain subscriptions were made to it. This subscription has not been paid in and is not expected, and the Constitution is hereby requested to return to the contributors any sums that it has received. “Sixth. The Atlanta Georgian subscribed $100, and I am informed that certain subscriptions were made to it. This subscription has not been paid in and is not expected, and the Georgian is hereby requested to return to the contributors any sums that it has received. HUNDREDS OF DOLLARE (sic) RECEIVED. “In addition to the above and foregoing, permit me to say in conclusion that additional sums aggregating several hundred dollars were subscribed by the public, but were not paid, and payment has not been and will not be requested. “With the above and foregoing statement, I pledge the public not to trespass further upon their time and patience, as my connection with the controversy is ended. I will in due season as a committee from the Bar association to pass upon the regularity of my employment in the Phagan case, and make its report, in accordance with the evidence. “I request the newspapers in the city of Atlanta in the future to refrain from publishing any statement that can be by the public construed as a reflection upon me either as a lawyer or an individual. “Atlanta, Ga., June 9, 1913. “Felder, Anderson, Dillon & Whitman, City. “In connection with the business of the above stated firm, of which I am a member, I occupy the position of treasurer. All letters addressed to the firm are placed upon my desk and are distributed by me, all moneys and checks paid in are turned over to me for appropriate disposition. “I have received from contributions to the Burns fund $102. Several of the contributions were anonymously made; in the majority of other cases contributors requested that their names be withheld, and in some cases the addresses of the parties making the donations are unknown to me. Under your direction, I am returning to the contributors the several amounts sent in by them, where the names and addresses of the contributors are known, and I am directed by you to return the balance upon their request. “I also desire to say that you have directed me to charge whatever disbursements have been made, which, by the way, are several times over larger than the contributions that have come in, to your personal account. This I have done. The detailed statement of funds paid in, as prepared by Mr. Anderson, follows.